Let me give you the Wikipedia summary: In the final months of the Holocaust, Raoul Wallenberg, a Swedish diplomat, helped tens of thousands of Jews escape certain death. He did so by ingeniously renting buildings in Budapest and, through his powers of diplomatic immunity, marked the buildings as Swedish territory. Jewish families were sheltered there under diplomatic protection. He and others managed these rescue efforts right under the nose of Adolf Eichmann, who was stationed in Budapest at that time to personally oversee the transport of hundreds of thousands of Hungarian Jews to the gas chambers in Auschwitz. It is no exaggeration to say that Wallenberg and those like him were true heroes. Wallenberg’s story doesn’t end there. Maddeningly, during the confusion of the Russian liberation of Budapest, Raoul Wallenberg was detained by Russian authorities and sent to a gulag, where he likely died (no one is sure). Wallenberg’s courageous work during WWII and his mysterious disappearance are worthy of widespread attention, but perhaps not through this book. 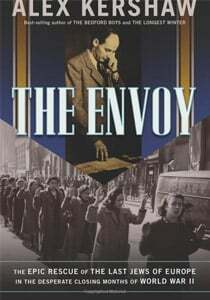 Unfortunately, “The Envoy” is written oddly – in some ways, it reads like a stilted accounting of facts; and yet the narrative often meanders into characterizations, anecdotes, impossible-to-know conversations, and disparate storylines of victims and survivors. However, these flourishes are also curiously bereft of the emotional weight that they are supposed to imbue. What it comes down to is that the writing just isn’t very good. It reads terse and flat, like a cheap suspense novel. While I don’t doubt the author’s admiration for his subject, by the simple and suspenseful way in which it’s written, I wonder if there was also an eye on film rights. Maybe a Ralph Fiennes thriller that pits Wallenberg’s courage and wits against Adolf Eichmann’s evil. Surely an Oscar winner with the right score. Bottom Line: An important subject that is rendered in cheap suspense. Christopher Nolan’s Dunkirk Trailer Looks Intense!